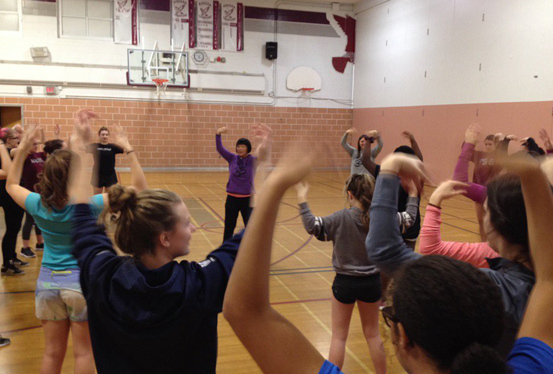 As part of its Be Well program, students and staff at Frontenac Secondary School participate in a Mindfulness + Qi Gong workshop that teaches us how to de-stress and decompress. Educators at Frontenac Secondary School have embraced a Be Well and Live Fit program to help students and staff deal with anxiety and stress – at school and at home. The intent of the program, which includes various activities that promote mindfulness (eating, breathing and colouring), gratitude and kindness. Teacher and Be Well facilitator Christine Jamieson says student feedback demonstrates the value of the program in supporting student wellness. Students shared that mindful breathing, for example helps regulate emotions and thoughts and allow them to focus on one thing at a time – a challenge for many teenagers. Students have the opportunity to gain confidence for self-guided play and exploration of nature. The Board partners with various community partners and caregivers to support the transition to school. Youngest and oldest students enjoy positive ongoing collaboration through buddy program. Planning process now includes steps to identify and remove possible barriers.